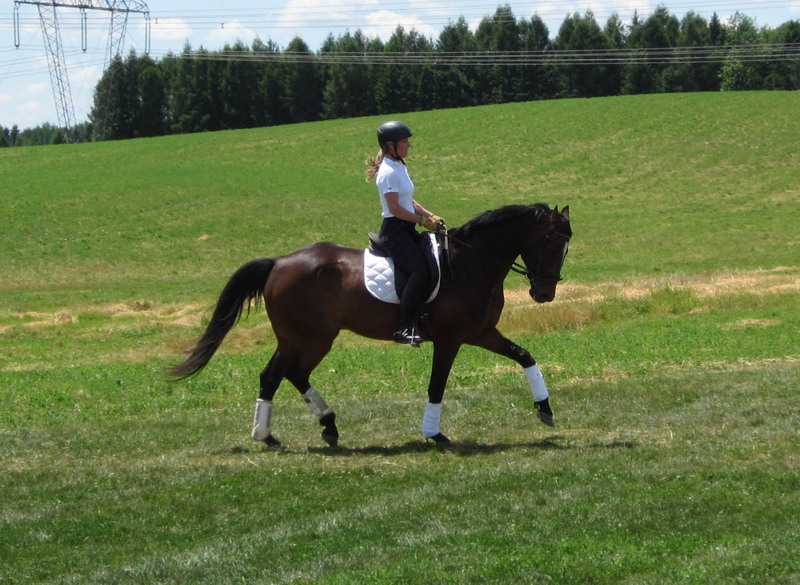 Dressage Training For Any Horse with Meredith Risk in Nobleton, Ontario. Just minutes north of Toronto. For Details click here. 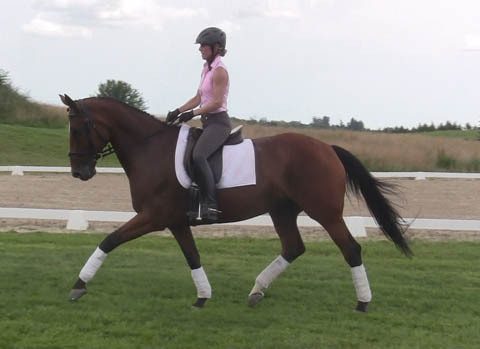 Policically Correct aka "Carter" is a 12 yr old, 17 hand KWPN cross gelding, schooling PSG. Carter is the consummate athlete. He had a successful career as an event horse up to Preliminary before he made the career change to dressage. Carter is incredibly talented, with three very impressive gaits. His flying changes are big and expressive and the extended gaits are a highlight. Carter is light off the leg and soft in the contact in either the snaffle or double. He would make a super upper - level horse for a capable amateur or young rider. Wolkenlady (aka "Bella") is a 15.3, 2010 Hanoverian mare by Wolkenglanz out of a Der Lord (DeNiro) mare. Bella was recently shown third level for the first time, and won all four of her classes with excellent scores! She also has consistently good show scores with her amateur owner at training through second level. Bella's greatest attribute is her bravery!! She gives a lot of confidence to rider and is totally trustworthy in new situations. We use her as the lead horse for young horses on their very first hack, and she is totally dependable. Bella has good, clean changes and lovely halfpasses. Halfsteps and passage have been started, and she shows a natural ability for both. She is extremely easy in the connection and naturally forward. She has never been lame, and has some recent, excellent radiographs that can be made available to interested buyers. I-Sealarda (Seala), is a 2013 registered KWPN mare (Dutch Harness Horse), standing 16.1 hands. Seala was backed here less than two months ago, and has been sweet and willing every step of the way. Seala has three absolutely spectacular gaits that will attract attention at shows and clinics. We feel that Seala has all the ingredients to go to the upper levels. She is forward and sensitive, but very level - headed. She has the expressive movement from the harness horse, without the "up and down" quality that can be a problem with extensions and ground cover. She truly represents the best of both worlds : expressive, elastic movement, with the brain and work ethic that is typical of the driving breeds. Seala would be suitable for an adult amateur, she has no buck, bolt or rear. She is currently barefoot, and has great feet and no health or soundness issues. Sales video was taken on her very first ride outside, she's a very sensible girl without being lazy or dull in the least! Erania is a very special 2009 KWPN mare by Special D. Although she is small in stature (15.1 hands), she has the gaits of a much larger horse! Not just the most petite riders look great on Erania, the rider in the video is 5"7. Erania has an excellent show record at training and first level, and will be showing fourth level this spring, with PSG on the horizon for the end of the summer. Although she has the brain for any level of rider (she was successfully and safety ridden and competed by a Para rider), she would be perfect for an amateur or professional rider with upper level aspirations. Her flying changes are super easy, big and expressive. 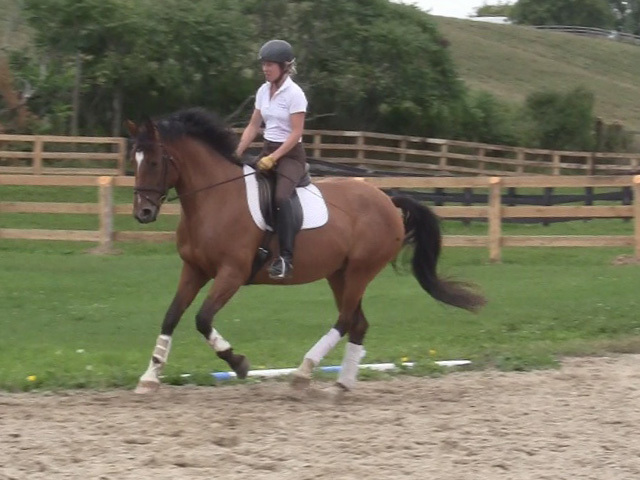 Her extended gaits cover an incredible amount of ground, she has the biggest extended canter in the barn! She also shows a clear ability to collect in all three gaits, her powerful hind leg and free shoulder makes the work easy for her. Most importantly, Erania has a temperament that is unsurpassed. She is very forward and light off the leg, without being hot, tense or spooky. Erania is very brave in new environments, she hacks safely alone or in a group, and has absolutely no health or soundness issues. We truly feel that Grand Prix is in her future, she has the engine, work ethic and trainability to go all the way. She is a super horse, and we are looking for a special home for her! Josie is a 2012 Appendix Quarterhorse mare, standing 15.1 hands. Josie has three nice gaits, and an absolutely unbeatable temperament. She is totally unflappable in any situation, she hacks safely, knows some basic dressage and has done some low jumps. She is incredibly simple to ride, with a very soft mouth and a lovely, "workmanlike" attitude. She would be an ideal horse for a petite adult or a young rider. Josie is safe for even a beginner. "Ellie" is a 10 yr old KWPN mare by Wellington, standing 16.2 hands. Ellie has been competed by an amateur for the last two years, scoring well into the seventies, with as high as a "9" for gaits. 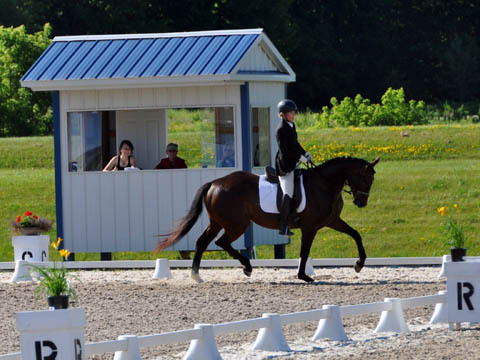 Schooling second level, Ellie has three absolutely beautiful gaits, with a lofty, ground covering canter, and a particular talent for extensions. She is absolutely safe and not spooky, and can be ridden by even novice riders, although she would be a great choice for the upper levels. Ellie is a rare combination of forward and sensitive, but still totally safe and reliable. High Roller is a 2010 Trakehner mare by Heling, standing 15.3 hands. High Roller is a petite mare with big, expressive gaits. She is extremely easy to ride, with an uncomplicated, sweet temperament. High Roller is not spooky or mare-ish, and would be an appropriate mount for an amateur rider. Auckland is a 9 yr old Canadian warmblood gelding by Indoctro, standing 16 hh. Auckland had a successful career as a show jumper before making the switch to dressage. He has three lovely gaits, and a sensitive and forward nature that makes him super fun to ride every day. Auckland has solid lateral work, effortless extensions and clean and expressive flying changes. His naturally balanced canter is designed for the upper levels, and he can easily do schooling pirouettes and has started tempis. In another 6 months, the PSG work will be confirmed. Auckland is absolutely amateur friendly, he is as safe as can be, and a perfect gentleman to handle and ride. He hacks bravely alone and in company. Auckland would make a perfect match for someone who wants a fun and safe horse to take to the upper levels. Manautulin is a 4 yr old Trakehner gelding, standing 16 hh, by the Grand Prix stallion "Hilton". "Manny" has only been under saddle for a short time, but shows a great aptitude and willingness for the work. He is a naturally forward, sensitive horse, but also amateur friendly. He is very safe and quiet, with an exceptionally easy and soft mouth. Manny has been ridden outside and hacked, and he has proven himself to be brave and reliable in new environments. He has three good gaits, with a very well balanced canter. He has been very easy to train, and has made great progress in a short amount of time. Manautulin is an athletic horse with a great temperament, and would be a successful dressage horse or eventer. Maya is a 2010 Trakehner mare by Heling, standing 15.1 hh. Maya is one of the sweetest, most willing and trainable young horses we've had here at Nobleton Dressage. 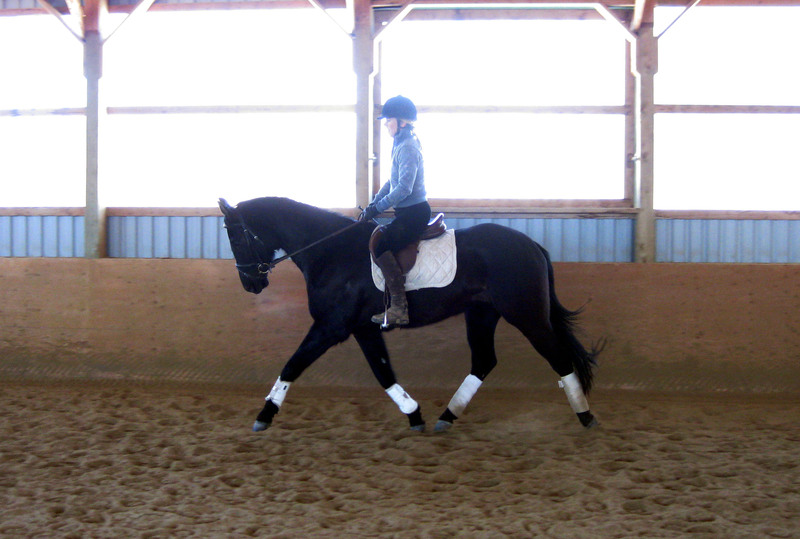 She was backed lightly this spring, and has been in dressage training for just a few months. This uncomplicated mare has three good gaits that are comfortable and balanced, and an absolutely outstanding temperament. Maya hacks bravely alone or in company. She would be suitable for any level of rider, and would make a lovely dressage horse or eventer. Maya has recent, clean x rays that can be made available to potential buyers, and absolutely no health or soundness issues. Mabeline is a rising 5 year old Trakehner Mare by Heling. She has 3 very good gaits, with a particularly scopey trot that covers ground effortlessly. Mabeline is tall and powerfully built, but she is sensitive, soft in the mouth and forward thinking, which makes her easy to ride by any size of rider. She is a super fun horse, she comes out every day happy and willing to work, and tries hard to please her rider. She was shown in 2013 by a junior rider, winning her first ever dressage test with a 72 percent. Her safe and willing temperament make her suitable for an amateur rider, but professionals will also appreciate her forward nature and trainability. "Sobe" is a super fancy 2007 gelding by Samarant. Bred by top Oldenburg breeder Shari Glickman at Goodness Ridge Farm, Sobe comes to us from the U. S. A. with a very impressive show record up to second level. He is schooling third level, with easy lateral work, and the flying changes started. Sobe possesses all the qualities needed for the upper levels, and is absolutely sane and safe for any level of rider. Layla is a 17 hand Irish Sport Horse mare, born in 2002. 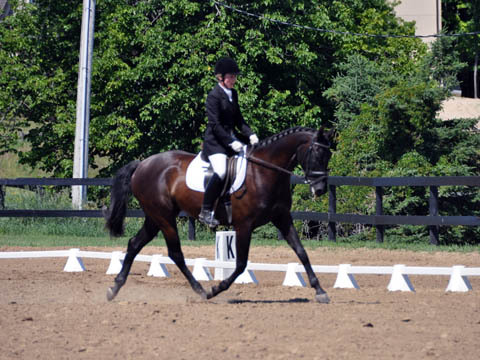 She began her riding career as a hunter, and recently made the switch to dressage. Layla was shown training level by her amateur owner last year, winning almost all of her classes. 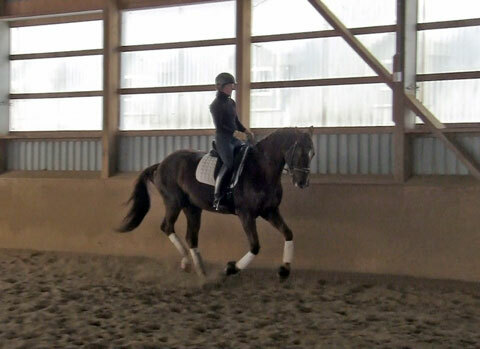 She is currently schooling third level, with easy lateral work and the changes started. Layla is absolutely sane and safe for any level of rider. She hacks bravely alone or in a group, and is the perfect horse for an amateur looking for a confidence-building mount. Daystar, aka 'Daisy', is an imported 2003 Hanoverian mare, by DeNiro. Daisy is a talented horse for the ambitious rider with FEI aspirations. Daisy is currently schooling PSG, with big, expressive changes, and super-easy lateral work. She is very forward-thinking and sensitive, but not at all spooky or mare-ish. With her quick and active hind leg, and aptitude for piaffe, Daisy makes a very promising Grand Prix prospect. This brave and talented mare is ready to take the right rider to the top! Video coming soon! Liesje is a 2010 Mare by Landfriesse II out of Riverdale by Kadans.Big beautiful mare with super gaits and a very willing disposition. Smooth to ride and a character that aims to please makes her a dream horse for an ambitious amateur rider. She has both super jumper and dressage lines in her pedigree which makes her a truly versatile prospect. Under saddle for just a couple of months, Liesje shows truly exceptional rideability for a horse of her age. We expect great things from this sweet and talented mare! Super quality prospect. She is incredibly well balanced for her age, powerful and active behind and is very forward and willing to work. Erania stands just over 15.1 HH at 4 years of age and will likely mature somewhere around 15.3 HH. Her bloodlines include some of the best dressage and jumper producers in the world including Metall (sire of Uthopia), Ferro, Ramiro, Doruto, Nimmerdor and Furioso. Erania was just started under saddle. This confident little mare with BIG gaits would be the ideal choice for a petite dressage rider looking for a serious prospect to work up the levels. West River is a super rideable brave and willing mare with strong ground covering gaits and a very nice quality jump. She is very straight forward to ride and would make a super hunter like her father but is built and bred to excel in a number of disciplines. Her bloodlines included the legendary sires, Graf Gotthard Z, Ramiro, Amor, Doruto, Secretariat, Wolkentanz and Fabriano. She's a medium sized mare that should mature about 16.1 HH. Serafino is a talented prospect for a serious dressage rider. A grandson of Sandro Hit, he shows the scopey and elastic movement of his famous grandsire. Combined with a kind and generous temperment, he has all the attributes to take the right rider to the top. Serafino has been to two shows already, and was shown in the FEI four year old class. Every score has been over 70 percent. At the RCRA gold show on the July long weekend, he was FEI four year old champion, with scores ranging from 72 to 74.2 from FEI judge Natalie Lamping, with very positive comments regarding his gaits as well as temperment. Standing 16 hh, Gallant is a black four year old Canadian warmblood gelding by Gervantus. Forward and willing, Gallant's rideability is exceptional for a horse of his age. He has three good gaits and is suitable for any level of rider. He has done some small jumps, and shows promise as a hunter as well. With his affectionate and sweet nature, Gallant would make a great partner for an adult amateur or young rider! Gallant competed in his first under saddle show on the July long weekend, and won both training level test 1 and 2! He handled the show atmosphere like a much older horse, and was relaxed and attentive in the ring. work, including leg yield and lengthen strides in trot and canter. She has some experience over fences as well, and is brave to the jumps with lovely form and scope. Chloe is very safe and amateur-friendly, she is not mare-ish or spooky. She has a lovely, affectionate and gentle temperament, and would make a great partner for almost any rider. Super sweet and talented, 2006 Canadian warmblood mare for sale. Rivella is by the Dutch warmblood stallion Oxford, who himself is a product of the renowned Burggraaf and Voltaire lines. Rivellas dam, Riverdale, is by Kadans, the grand prix dressage stallion competed successfully by Tom Dvorak. Rivella has lovely, elastic gaits and an incredibly sane, willing temperament. Rivella was leased by a junior rider over the summer who showed her and received scores up to 67% at Palgrave. Rivella would be suitable for any level of rider, she can be hacked by herself or in company, and has done some jumping as well. She handles herself on the ground and under saddle with a maturity that is not typical for a horse of her age! Callisto, dark bay Canadian Warmblood gelding by Eastern Ruler, born in 1998, standing approximately 17 hands. Callisto has the breeding for dressage stardom, his half brother, Lindor's Finest, is currently competing successfully at the grand prix level with Ute Busse. Callisto is schooling third level, with halfpasses and changes started. He is a super fancy mover, with a powerful engine and a very expressive front leg. Callisto is kind, quiet and safe enough for even a novice rider. He hacks alone or in a group, he is uncomplicated to handle and easy to ride. Callisto would be perfect for an amateur rider looking for a high quality horse that is sane and trustworthy. Try a 'horse of a different colour'! With a pedigree influenced by such greats as Burggraaf and Voltaire, Sona is athletic and talented. His eye-catching 'blonde' color only adds to the appeal. In dressage training for only a month, Sona shows a great willingness to work, as well as a lovely, cadenced trot and a balanced canter. He also jumps - he is scopey and brave, and has already done some hunter shows, always placing at the top. Sona is sensible and safe enough for an amateur rider, he also hacks and trailers like an old pro. He would be a great choice for a dressage horse or eventer, all three disciplines are no problem! Videos Updated February 2011, see the previous video here. Lovely 2006 Canadian warmblood for sale or part board. Loftly, elastic gaits that would be suitable for the dressage or hunter ring. Anika has the talent for a professional, but with a temperament that is very amateur friendly. She is by the Dutch international jumper Ikoon, and out of a Lorbas mare, who is full sister to a number of successful junior and amateur jumpers. Anika has been shown lightly on the schooling hunter circuit, and the judges love her! She is brave and scopey, with a well balanced canter, and swaps leads easily. 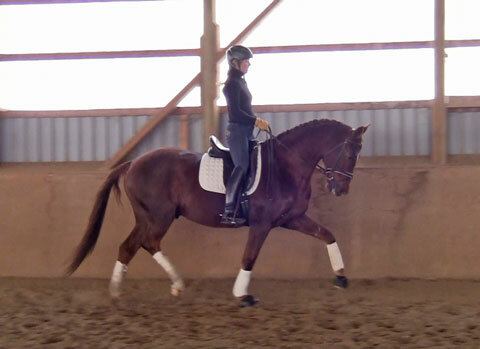 In professional dressage schooling currently, she shows promise for the dressage ring also. Brave, uncomplicated, and not mare-ish, Anika is the perfect horse for a rider who wants the talent that top breeding can bring. Anika was ridden recently in a clinic with Erynn Ballad, who remarked 'beautiful gaits, beautiful jump!' you choose the discipline, she will excel in either. 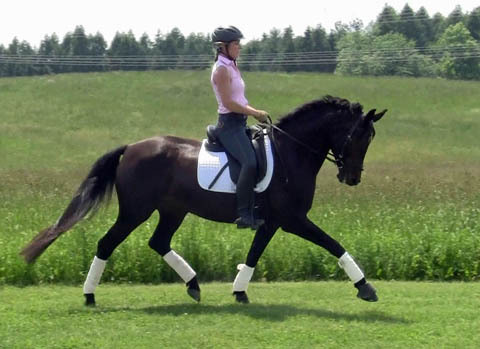 Dressage Training For Any Horse with Meredith Risk in Nobleton, Ontario. Just minutes north of Toronto. For Details click here.